If you have forced air heating or cooling, you could lose up to 20-30% or more of your energy through the duct system. Insulating and maintaining your ducts will save energy and make your home healthier and more comfortable! While you probably rarely think about the duct system in your home, the truth is it can have a major impact on your energy use. If you have a central forced air heat or cooling system, your duct system distributes the warm or cool air from your furnace or AC unit throughout your home and then returns air back to the system. Leaky ducts waste heated air and make your heating system work harder to keep your home warm. Duct insulation and maintenance is essential to efficient heating and cooling, and can dramatically reduce your energy use—saving you money. More importantly, your duct system should ensure that only clean air is circulated in your home. It should balance air pressure, support ventilation and prevent unhealthy furnace emissions or radon gas from your basement from leaking into your living area. Properly maintained ducts ensure healthy, clean and safe indoor air. Visual inspection. You can also visually inspect your duct system to look for problems. 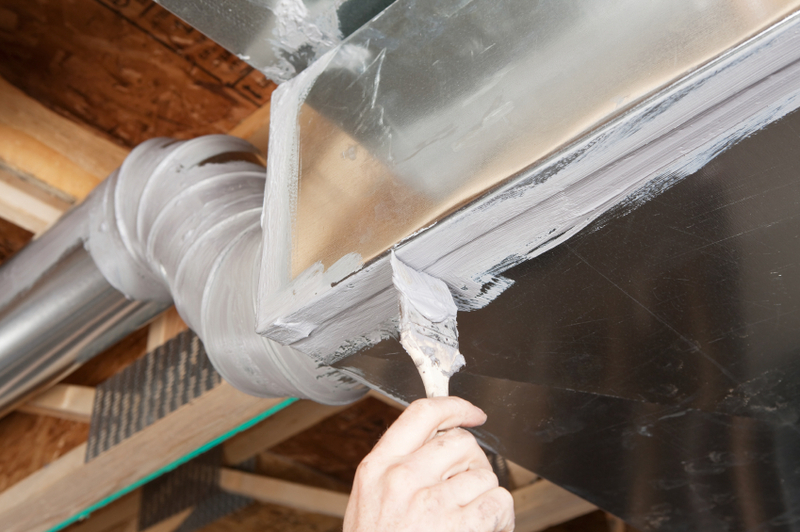 Ducts are commonly made of metal, but some are fiberglass, fiberboard or plastic. In some homes, building spaces (such as the space between joints in your ceiling) function as ducts. If you choose to inspect your ducts yourself, be safe! Wear a mask in any area with fiberglass or loose fill insulation. Also, check for heat before touching any active ducts. Learn more in the Energy Star Duct Sealing brochure. Call a professional. Inspecting your duct system can be tricky, as ducts are often located in the attic, walls, ceiling or basement and some problems are hard to detect. To be certain you have identified all problems, it is best to call a professional to properly inspect your home. Check local listings in your area to find licensed professionals and it’s always good to remember to check references! Regular inspections. Even if you don't have any indicators that duct repairs are needed, for health and safety, it is recommended to get your ducts professionally inspected and cleaned every three to five years. Consider scheduling a professional inspection now, or schedule it within the maintenance window. Since ducts are often difficult to inspect and repair because they are located in walls, ceilings, etc., it is generally recommended to use a professional for repairs. Although sealing leaks and adding insulation may seem like simple tasks, improper duct maintenance could result in pressure imbalances and problems with air quality in your home. Gases from your furnace and other sources can significantly compromise air quality and can be a serious health risk. Maintenance by a professional will avoid major problems. Hire a professional. Find a professional in your area and schedule them to inspect and make necessary repairs. Typically, duct insulation and repair costs $300 - $500 or higher, depending on the level of repairs required. The best news, the work usually pays for itself in a few years through energy savings. Be sure to look for rebates in your area to help save money when you complete this action! Time for Replacement? In some cases, the cost of repairing old or leaky ducts can be greater than the cost of replacing your duct system. Duct systems that are difficult or costly to clean, such as those made of fiberboard or using building space for air circulation, might also be candidates for replacement. When installing a new heating and cooling system or undertaking a major renovation, consider a new, efficient duct system—or better yet, consider a highly efficient ductless Heat Pump Space Heating system that provides low cost and low emission heating and cooling! Now that you have done the big job, don’t forget the easy one! Remember to check and replace your air filters regularly to keep your system working well. Check out the Replace AC Filters action page to get started.